“So, let’s dive right in and take a look at the sell-through versus the sell-in business models. The sell-through business model, which a lot of companies have adopted, is where you recognize revenue when your distributor or your reseller transfers or sells the product to an end user. This is a method that a lot of companies like, because you don’t need to make estimates about what the ultimate discount or transaction value’s going to be because it’s known when your distributor sells to the end user. Their contract has a set price, and you use that to determine your price to the distributor. A lot of companies have found that to be really useful because estimates can be messy – they require a lot of effort and they have to be adjusted if they’re not the same as the actual results. 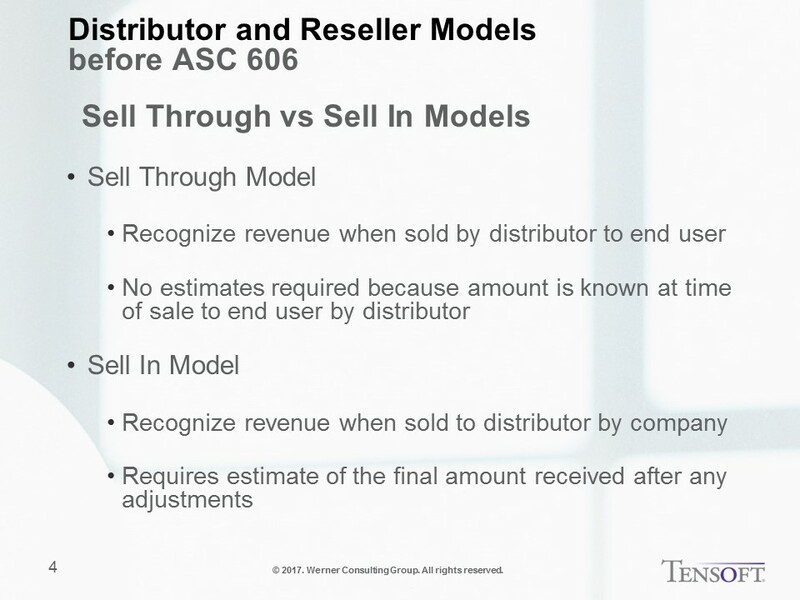 The sell-in model is when a company that uses a distribution method through resellers or distributors recognizes revenue when they sell to the distributor. This requires an estimate of what the final amount is going to be if that amount could be different than the contractual price. So, if there are any volume discounts, rebates, stock rotations, returns – all those things have to be taken into account and estimated. And that estimate must be used in the determination of what the transaction price is going to be. Companies may find this a little more difficult, but it’s required under the new revenue recognition standard, ASC 606. And, it will adjust the timing of revenue, because if you recognize revenue on the sell-in model you’re recognizing that earlier than if you recognized revenue on the sell-through business model. To learn more on this topic, view the full recording here. 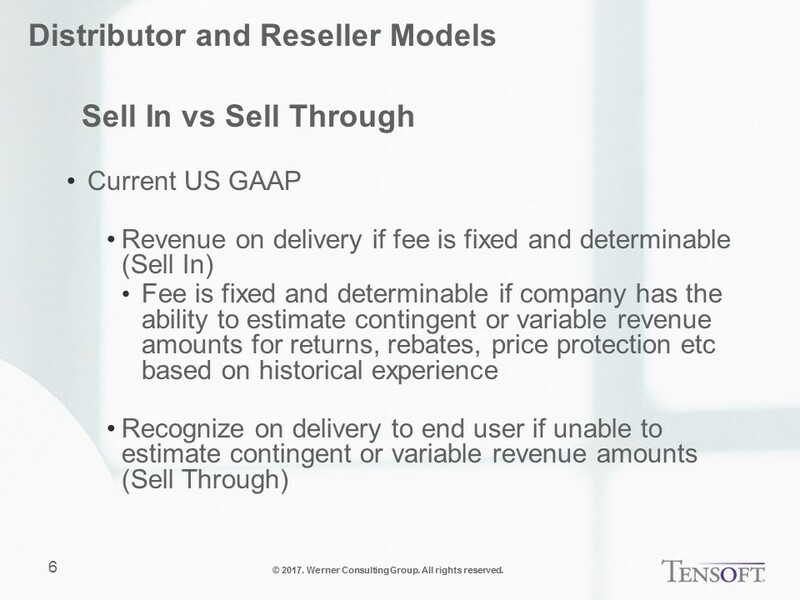 Tensoft regularly hosts free and for-fee CPE eligible training webcasts to share valuable information on the recent developments in revenue recognition. If you are interested to receive an email notification when another webcast is scheduled, click here to sign up.